December 19 Ukraine celebrates St. Nicholas Day. Congratulations to all the upcoming professional holiday! Prima Our congratulations co Avtomobilist day. In situation when registration of the necessary customs documents demands some time, cargoes are usually transferred to the warehouses of temporary storage. Goods storage in warehouse has its limited period and is strictly regulated by the legislation. 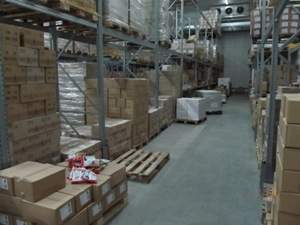 One of the main conditions of warehousing in Zhitomir is the accurate control of quantity and cargo type accounting, availability of the necessary normative documents at the cargo's owner. According to the law, the owner of cargo has no right to take out cargo from the warehouse partly, only a full lot. Warehouse of temporary storage is, in fact, transshipment terminal for foreign cargo during the customs registration and other procedures. Usually, the cargo can be in warehouses on terms of customs mode from 24-hour period to two months. However the the company ACRIS LOGOSTIC gives the opportunity of warehouse rent renewal at the renter's will. - Open type warehouse. It can contain any cargoes which storage doesn't provide special conditions (temperature mode, tightness, etc.). Any private person or legal body can use the services of such warehouse. - Sheltered warehouse. The inward cargoes of a certain type are usually stored there. The list is established by the legislation, including those which trade turnover is limited or the goods which demand special environmental conditions: food, forage, medicines, etc. The choice of warehouse type for the cargo is defined by the owner, however for sheltered warehouse rent it is necessary to specify the need, the reason and individual storage conditions. The company ACRIS LOGOSTIC works at the market of warehouse and logistic services in Zhitomir for more than 5 years, and offers cargo storage in warehouses of different types. Temporary storage warehouses of the company ACRIS LOGOSTIC in Zhitomir is one of the most convenient and safe ways of cargo storage of various types for the period of customs registration.